The culture of elegance and royalty is reflected through the Rajputi jewellery. You can try them on your wedding day and give your D-Day a royal touch. Rajasthan is known for its culture and jewellery. 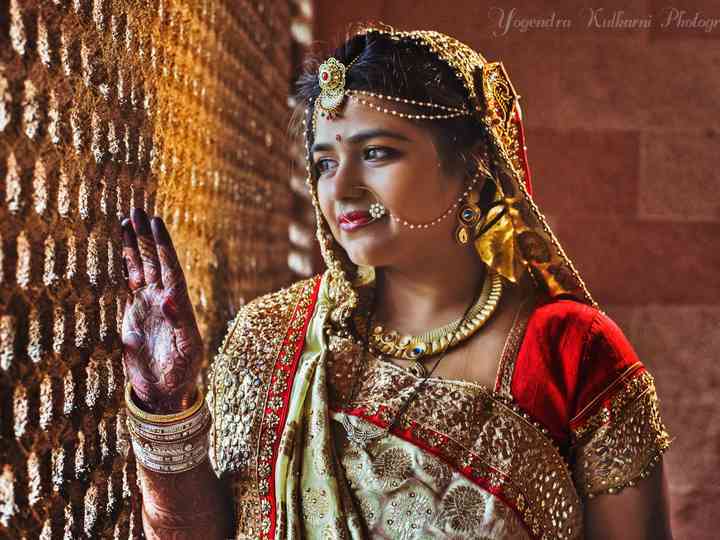 A Rajput wedding has its own uniqueness and elegance. Here are some components of Rajputi jewellery set for a bride of a Rajput wedding. Necklaces form a big part of Rajputi jewellery. A Rajputana necklace set consists of the Rani Haar, Guluband and the Aad necklace, among many other things. A Rani Haar as the name suggests is a necklace worn by Rajput queens. It is considered to be a special bridal jewellery collection for a long time. It comprises strings of precious or semi-precious stones, such as pearls and emeralds, closely knit together. A Rani Haar is traditionally a necklace made of three to six strings of pearls, ending in a beautiful statement piece, thus giving it a nice, royal touch. Satlada necklace is a variation of Rani Haar. Satlada is a Mughal styled necklace, hardly worn by Rajput women. A Rani Haar is gifted to the bride at her wedding. A Guluband is one of the very first choices of a Rajput bride. It is versatile and suits almost anyone. A Guluband falls somewhat between a choker and a Rani Haar – neither too tight nor hanging loosely. This piece of jewellery is suitable for any bride, as it can be worn easily, irrespective of the length of the neck. The Guluband is also known as the princess necklace. A traditional Rajasthani necklace, an aad has a square or rectangular choker with pearls attached to the centre. It is also known as Rajputana necklace. Hathpan, also known as Hath Phool or Hathpanja, is an intricate piece of jewellery adorning the back of the palms and the wrists. A Hathpan comprises of gold finger rings attached to a gold medallion via one or multiple strings and other strings attached from the medallion to the bracelet around the wrist. Hathpans are generally made of gold. They are a popular accessory for Rajputi bridal wear. Hathpans are available in various types. Hathpans consisting of a single to three rings are also popular. Some of them do not have a medallion and the rings are attached to the bracelet directly via the strings. Kundan Hathpans are quite a popular statement. Like Rani Haar, Hathpans are gifted to the bride on her wedding day. Rajputi Kada or bangles plays a huge role in a Rajput wedding. It is also an essential part of the bride’s wedding attire. A Kada is a round bangle made of gold. It is thick and smooth in proportion, making it wide in diameter. A Kada may or may not have a clasp. When it comes to Kada, two major types come into the forefront — Bangdi and Gokhru. A Bangdi is a type of Kada which is round with thick lining and has small, round gold protrusions. The gold protrusions must necessarily be round in shape. However, a traditional Bangdi does not have a clasp. Gokhru is a Kada which is smaller than a Bangdi but thicker in diameter. It has cubical gold protrusions, as opposed to round ones in a Bangdi. A Nath a.k.a. the nose ring is a subtle piece of jewellery that exudes the beauty of womanhood. Rajputi Naths are quite extravagantly striking and can notch up your bridal attire to a great level. The origin of the Nath was due to the Middle Eastern heritage and was brought by Mughals to India. Naths became prominent during the 15th century after a Rajput painting of women was found in which women were wearing these nose rings. This painting, highlighting the beauty of women enhanced by this particular piece of jewellery, was praised by the painters and the poets. Rajputi Naths are of various types – from the Kundan to the Nathuri. Kundan and Meenakari are two of the Rajputi jewellery that draws inspiration from the tradition and ethnicity of the clan. Simple nose rings embedded with beads are another type of Rajputi Naths. A Nathni is worn by Rajput brides. A string or chain is tied to the golden hoops. It can be encrusted with precious and semi-precious gemstones. Another type of bridal nose ring is the Nathuri. Unlike a Nathni, it is much simpler and smaller in looks and dimensions. A Nathuri is made up of gold or silver and it may or may not have two to three precious or semi-precious stones embedded on it. Bajuband (armlet) is a significant part of Rajputi jewellery for brides. Metals like gold and silver are mostly used for bridal Bajuband. It can be simply made of the said metal or have various stones adorned on it. Dainty armlets, or Bajuband, look beautiful when worn with bridal apparels such as sarees, lehenga and choli. Rajputi jewellery set for a bride is incomplete without earrings. Rajasthani earrings have that rich and antique look that makes them quite popular these days. They are popularly known as Kaanbali or Surliya in Rajasthan. The Rajputi earrings are elegant in design, which makes them unique in nature. Colourful and rich in its cultural aspects, Rajputi jewellery never ceases to fascinate us with its traditionalism, blending with it, the contemporary fashionable world. Do you want to try any of these jewellery items on your wedding day? Do share your thoughts with us.